Interested in how CADLearning can help your customers? As an Autodesk Authorised Publisher, CADLearning focuses exclusively on creating courses with engaging, concise lessons covering over 50 of the most popular Autodesk titles including AutoCAD®, Civil 3D®, 3ds Max®, Inventor®, Maya® and Revit® Architecture. Students can learn at their individual pace, search for the exact answers when needed, get guidance in new applications or refresh their expertise on a topic or concept at any level. Utilised by professionals and educational institutions around the world, CADLearning courses include video tutorials, assessments and exercise files that allow users to follow along in their Autodesk software during the lesson. This suite of Autodesk content is suitable for anyone looking to expand and develop their Autodesk knowledge in one or more of the Autodesk programs. Our bite-sized learning modules, developed by industry experts, complement and reinforce classroom instruction and help students master new applications, topics and concepts. With over 40,000 video tutorials and 240+ self-paced training courses, the CADLearning video library is the largest collection of learning content for Autodesk software in the world. Videos are short and to the point and range from 2 to 5 minutes. The format of concise explanation and demonstration is specially designed to help Autodesk software users find the answers to their questions quickly in completing their design tasks. A flexible on-demand learning resource that is available anytime, anywhere on any device. Our atomised learning modules, developed by industry experts, complement and reinforce prior knowledge that will help you to master new applications, topics and concepts. Delegates can learn at their own pace, search for the exact answers when needed, get guidance in new applications or refresh their expertise on a topic or concept at any level. Create your own customisable, drag and drop, playlists to structure content in the best way for you. 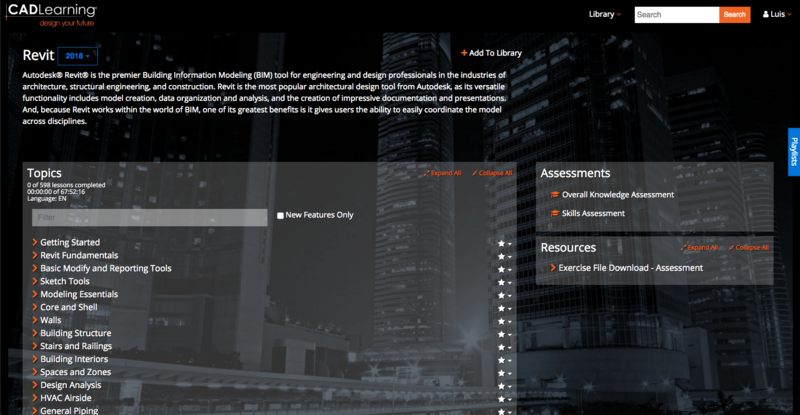 Utilised by professionals and educational institutions around the world, CADLearning courses include video tutorials, assessments and exercise files that allow users to also progress in their Autodesk software. CADLearning includes the opportunity to undertake assessments to test your students knowledge and will automatically create a lesson on any incorrect answers, ensuring they skill up in those specific areas. CADLearning also includes lessons with objectives set to help with passing Autodesk exams which is a fantastic way to prepare.